Adding to the buzz of creativity in Budapest is a cafe, pop-up, and design studio called Printa. The on-site silkscreen and fashion workshop produces garments that are displayed in the gallery area along with art by up-and-coming designers. Printa’s newest collection, Aware, realizes founder Zita Majoros‘s ambitions of making use of otherwise wasted materials, and employ talented Hungarian seamstresses. 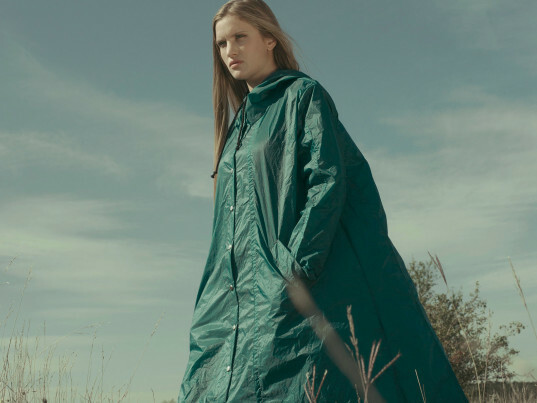 The garments are crafted by repurposing and embellishing a wide range of throw away textiles such as paragliding wing, military wool blankets, and vintage hemp canvas, which is very hard to imagine when seeing the tailored, and high design look of the final products. Majoros says that she has been concerned with the planet’s future since she was a child. Even when we she began her career in design, she was most interested in the materials and how they were produced. The Aware collection includes a variety of pieces, with the challenge of replication using waste fabrics. “One of my first collections was a bag collection made from recycled leather jackets and since then, I’m designing clothes for women, some for men, collections for kids, and T-shirt-graphic collections; all of them are made from recycled materials.” Laying out patterns to replicate pieces for the collection, can be difficult when using textile waste that may have unpredictable imperfections, but the team finds it very inspiring. Where the fabric originates is also a huge source of inspiration. A majority of the waste products come to Hungary from Western countries. Adding to the buzz of creativity in Budapest is a cafe, pop-up, and design studio called�Printa.�The�on-site silkscreen and fashion workshop produces garments that are displayed in the gallery area along with art�by up-and-coming designers.�Printa's newest collection, Aware, realizes founder�Zita Majoros's ambitions of making use of otherwise wasted materials, and�employ talented Hungarian seamstresses. The garments are crafted by repurposing and embellishing a wide range of throw away textiles such as�paragliding wing, military wool blankets, and vintage hemp canvas, which is very hard to imagine when seeing the tailored, and high design look of the final products.